Posted on 3/3/2010, 9:16 am, by jungrrl, under Gamer Wednesday. Watch out! There are space invaders on your head! 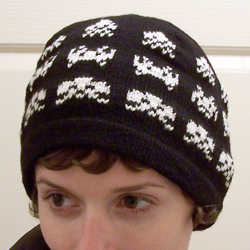 Peppersaskatoon made this awesome Space Invaders hat for a very lucky friend. She actually made her own intarsia chart (although there is one available through Knitty) because she’s just that crafty! You can see more great crafts by viewing the Space Invaders tag. I will have to make one! !